Agile Failure - UK's biggest software project not close to release. Ever. Universal Credit is the world’s biggest ever “agile development” software project and a massive financial and social (and hence political) risk for the government. Unless delivered on time and on budget then the consequences are grave – some of the most vulnerable people in society could be left literally destitute, with all that entails for their personal welfare and social order. The research, which combines a global survey of more than 500 executives with 15 executive interviews, found that 64 percent of respondents say cloud-based collaboration tools help businesses execute faster than would be possible otherwise. Another key finding is that the cloud enhances collaboration across time zones and functional boundaries. Fifty-five percent of those surveyed — 87 percent of leaders — say that capabilities enabled by cloud-based solutions represent a true breakthrough in collaboration. The cloud also enables more-efficient business processes, according to the survey. Fifty-eight percent of total respondents and 90 percent of leaders say cloud-based collaboration has the potential to improve business processes such as purchasing, manufacturing, marketing, sales and technical support. A huge majority (93 percent) of the leaders say cloud-based collaboration stimulates innovation, and say non-IT executives are becoming more involved in the selection, implementation and management processes relating to cloud-based collaboration tools. "The ability to collaborate in the cloud is becoming a key driver of competitive advantage," Bruce Rogers, chief insights officer of Forbes Media, said in a statement. "Leading companies are doing more to foster cloud-based collaboration — not only internally but also with an ever-wider swath of external groups including customers, suppliers, partners and even regulators." The benefits of cloud-based collaboration include greater efficiency, organizational dexterity and innovation, Rogers said. Ireland - tax haven? How about "Knowledge Haven"! Ireland's strength is in the intelligence of its citizens. Providing knowledge workers (and the companies that build the products they use) a legitimate international (and EU) base makes great sense. Like when the monks of old squirreled away knowledge from the viking invaders, and saved information so western civilization could rise again after the plague/Dark Ages. This NY Times article makes Ireland seem like a haven for extra-nationals, but, in fact, the Republic has done wonders (think, Celtic Tiger) to open the EU to U.S. and other companies, from China and Japan, for example. EU unfair treatment of Asian trade was first tackled in Dublin. And the heart of innovative financing (yes, even derivatives) can be found in Dublin's financial district. Not so mention the US-Ireland bond that is so strong, Ireland's own legal system mirrors the U.S.
Complex tax systems are meant to be scrutinized by companies' accountants, and the best value for share-holders delivered at the lowest cost. Ireland recognizes this capitalist truism. Amazon launched a version of its cloud services for government agencies, called GovCloud, in 2011. And now AWS has received its Authority to Operate (AOA) letter. The U.S. Department of Health and Human Services served as the sponsoring agency for AWS. Kevin Charest, HHS's chief information security officer, said in a statement that that all HHS operating divisions can now use AWS with minimal duplication in vetting Amazon's cloud security. FedRAMP was created in 2010 through a joint effort by the General Services Administration, National Institute of Standards and Technology, Department of Homeland Security, Department of Defense, National Security Agency, Office of Management and Budget and the federal CIO Council. Cloud service providers must be sponsored by a federal agency to considered for FedRAMP. U.S. government entities are already using AWS, the company said, adding that numerous agencies provide "systems integration and other products and services to governmental agencies are using the wide-range of AWS services today." Amazon said GovCloud content cannot be accessed by people outside of U.S. borders. Because of the limited access, Amazon said agencies can safely move more sensitive data while remaining in cooperation with government regulations. GovCloud supports the same security controls available in existing AWS regions such as FISMA, FIPS 140-2 compliant end points, SAS-70, ISO 27001, and PCI DDS Level 1. It's also in line with HIPPA laws. The goal of saving $3 billion by closing 1253 data centers is 'very realistic,' says David Powner, director of IT management issues at the U.S. Government Accountability Office — except that agencies haven't been able to track cost savings for the initiative. Eighteen months from the 2015 deadline, 'we have no idea how much we've saved the taxpayers,' said Steve O'Keeffe, founder of MeriTalk, an online community for government IT issues. This isn't the first snag in the project. Almost a year ago, Slashdot reported that the project was woefully behind schedule. The government released a summary of what data they do have (PDF), and at least the DoD expects to save $575 million next fiscal year. Many organizations are turning to crowd sourcing to attack data gathering problems. THis so-called “wisdom of the crowds” approach is very compelling: thousands of free-roaming, autonomous data input points, possibly at no cost (or maybe even getting a revenue stream from the app itself). Of course, overcoming privacy concerns (linking the GPS data of each device to the user) is a challenge. For example, TomTom uses data from its devices for traffic condition reporting -- in real time. The approach consolidates data from all the TomTom sat nav in use to get the actual speed of traffic on roads at certain times, versus the posted speeds. They also allow their users to submit map updates. After about 30 days from release, there were more than 6,500 updates to the maps. Eco-warriors can get the power of crowds on their side with this. Find out where water pollution sources are -- but with augmented sensors, as this approach relies on a sensor plugged into the audio jack on a smartphone that senses water quality using a microeletromechanical (MEMs) sensor inside the dongle. The goal is to eventually use the MEMs packed into the device to measure nitrate, heavy metal, carcinogens, and bacteria in water. With long travel time comes more stress -- and other studies show commuting to work (by car) causes a tremendous amount of stress. People who have a long commute end up gaining weight. If your commute is long, you will just get in better shape by commuting on bike. Of course, DC boasts some of the longest commute times. Why not enjoy the benefits of cycling, as this report (PDF) summarizes, to get the most out of spring? When you commute to work by bike, you are guaranteed to have two exercise sessions a day. Even if you don't feel motivated, you will be forced to ride your bike home at the end of the day. One study published in the Archives of Internal Medicine showed biking is associated with less weight gain in middle-aged women. Riding a bike burns plenty of calories, although exactly how many depends on your pace -- but you can lose weight by biking. The evolution of space data system standards has gone on in parallel with the evolution of the Internet, with conceptual cross-pollination where fruitful, but largely as a separate evolution. Since the late 1990s, familiar Internet protocols and CCSDS space link protocols have integrated and converged in several ways. While IP-like protocols are feasible for short hops -- from a ground station to orbiter, rover-to-lander, etc. -- delay-tolerant networking is needed to get information from one region of the solar system to another. It becomes apparent that the concept of a "region" is a natural architectural factoring of the InterPlanetary Internet. Mr Cerf sums up the problem thusly, "...the speed of light is slow relative to distances in the solar system. A one-way radio signal from Earth to Mars takes between three and half and 20 minutes. So round trip time is of course double that. And then there’s the other problem: planetary rotation. If you’re communicating with something on the surface of the planet, it goes out of communication as the planet rotates. It breaks the available communications and you have to wait until the planet rotates back around again. So what we have is variable delay and disruption, and TCP does not do terribly well in those kinds of situations." The Disruption Tolerant Networking (DTN) program establishes a long-term, readily accessible communications test-bed onboard the International Space Station (ISS). Two other components will serve as communications test computers that transmit messages between ISS and ground Mission Control Centers. Read more at Wired and more info at NASA. Forget Quantum Computing -- the Government has a "Quantum Internet"
Having perfectly secure communication based on the powerful laws of quantum mechanics would spark a revolution in world-wide communications and data processing. 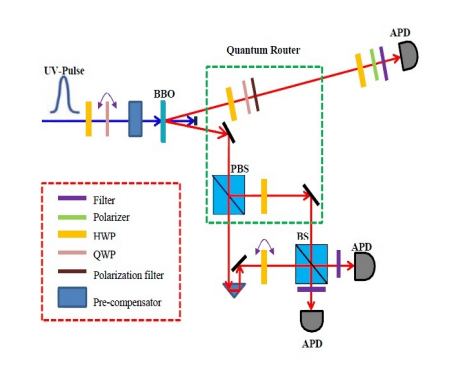 The current generation of quantum cryptography systems are point-to-point connections over a single length of fiber optic cable, so they can send secure messages from point A to point B, but cannot route information onwards to other destinations. Because the act of routing a message requires reading the part of it that indicates where it has to be routed (the header), that part has remained "in the clear". Many scientists are working to develop quantum routers that will fix this problem by steering quantum messages without destroying them. Instead of sending the 0s and 1s of digital code, quantum communicators can send information in a superposition of states that represent both 0s and 1s at the same time. What’s more, separate quantum objects such as a pair of photons can be entangled, which means they share the same existence even if they are widely separated. That leads to a form of quantum information that has no classical counterpart. One approach is to encipher the router tables -- as long as the hub is secure, then the network should also be secure. The problem with this approach is scalability. As the number of links increases, it becomes increasingly difficult to handle all the possible connections that can be made between one point in the network and another. Quantum computers will exponentially increase the power of computing, and we may soon have a network to support them. Read more at this detailed article.